The second tropical system of 2016 has formed off the coast of South Carolina and Georgia and is expected to become Tropical Storm Bonnie late Saturday or Sunday. 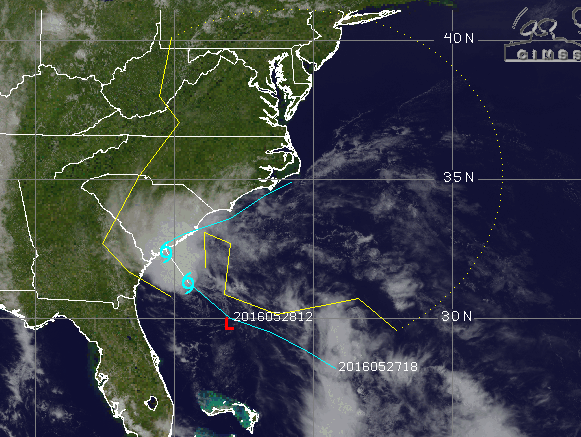 Tropical storm warnings were in effect from the Savannah River in Georgia to Little River Inlet in South Carolina. The future track of the storm is uncertain – it may trek inland or ride the coast northeastward – though the system is expected to weaken after making landfall in South Carolina. Southerly vertical wind shear is forecast by a forecast model to keep the storm from strengthening, a forecast issued by the National Hurricane Center said. Whether the storm will affect weather in New Jersey over the coming week is largely unknown, though impacts – if any – would likely be in line with a storm below tropical storm strength.